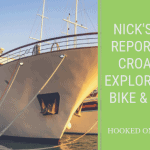 Welcome to Hooked on Cycling and our exciting cycling holidays in Greece. We’re an established self-guided cycling tour operator with many wonderful guided bike vacations around the world to offer cycling enthusiasts of all ages and experience levels, including our immensely popular guided and self-guided tours of Greece that take in the timeless beauty of Greek islands like Corfu, Kelafonia, and Rhodes. Our team of cycling tour specialists live and breathe cycling, love travelling to new destinations around the world, and have developed several fabulous cycling holidays in Greece for you to make a selection from so that you can discover for yourself why Greece is now one of the most popular cycling holiday destinations in all of Europe. The cycling tours we’ve developed are of varying grading levels so everyone can find an exciting cycling tour that’s suitable for their age, experience and degree of fitness, and enjoy a tour that gets them out and about in some of the most beautiful landscapes found anywhere in Europe, not to mention the world! We have developed self-guided cycling tours where you’re cycling to each and every destination on the itinerary, as well as guided tours that combine bicycle travel with boat travel, like our tours of the Cyclades Islands, which comprise more than 30 islands and were the cradle of the first European civilisations, and our cycling tours of the Ionian Islands which include the islands of Corfu, Paxos, Lefkas and Ithaca. Our Greek cycling tours are therefore designed with everyone in mind, so whether you’re holidaying as a couple, a family, or as a group of friends, Hooked on Cycling has a cycling tour of Greece which would be perfect for you, one which takes in the parts of the country that you most want to experience on your next cycling tour. What do you expect to see when cycling through Greece? If you expect to witness remarkably majestic landscapes, beautiful beaches with tranquil turquoise waters, rugged coastlines, impressive geological formations, fascinating historical sites of immense importance, sun-bleached Greek towns and villages, and the awe-inspiring sight of the sun slowly setting over the Mediterranean from the deck of a yacht, then our Greek tours are definitely for you. Please take the time to read about the exciting cycling tours of Greece we’ve developed for you by clicking on the links below. Our cycling experts have created a detailed itinerary for each of the tours we currently offer to help you decide which of our tours you find the most appealing, and you’ll also find what each tour includes, the available extras, our tariffs, etc., along with details on how to get there. You shall stay in three different locations which allows you to explore the best areas of the island. You will pedal through remote villages, will taste the local wines and olives and enjoy the mild Mediterranean climate.